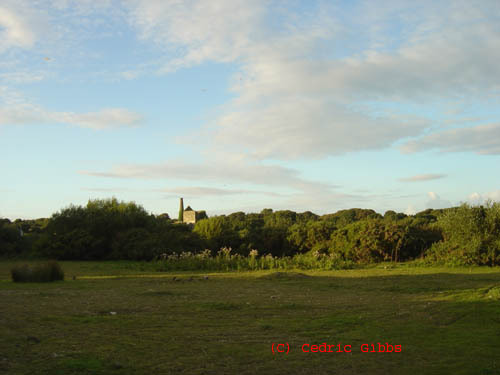 There have been a number of sightings around Wheal Busy. Truro. Four separate sightings have been reported to CUFORG. craft-shaped objects. One of the original photographs. beside or below their digital enhancements. "It was clear conditions with a bit of cloud cover, just before sunset. No rain and just a slight breeze. I glanced up just in time to see a large metallic boomerang shaped object in the sky, moving downwards slightly as it whirled and flipped at great speed. It was gone in about two seconds. It was a very deep gray, uniform colour and had a metallic gleam. 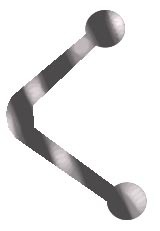 The 'arms' of the boomerang were rounded out in ball type shapes. It seemed to disappear as if it was either flying off very fast or moving into another dimension. To my eye, however, it disappeared into thin air (I did not see it retreat into the distance)." The witness also reported strange physical sensations and both her and the person with her reported strange visual disturbances, that looked like 'floaters'. Below is an impression of the object drawn by the eyewitness. 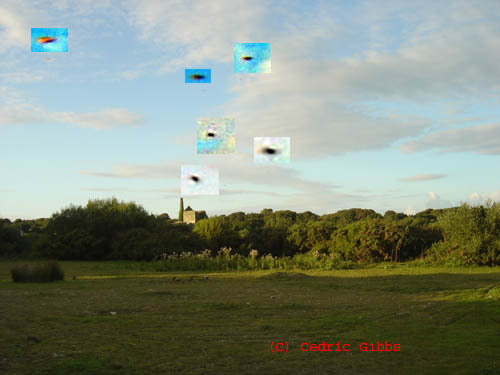 "It was a craft shaped object in the sky and looked white/metallic and had an irregular path. It tilted slightly to show a shaded underside and was moving very fast. It looked as though it was in freefall, swerving around on a very smooth trajectory. It was about the size of a plane . It happened at about midday with a clear sky, the sighting lasted about 30 secs until the object became to distant to see." Did you see anything mysterious in the skies above North Devon yesterday morning? Let us know by emailing sophie@northdevonjournal.co.uk. 2.22am, initially from my kitchen window (Par, Nr. St Austell). I looked out of my kitchen window whilst washing pots after a baking session and noticed what I first thought was a very bright star, but unusually bright. It was visible above the rooftop of one of the houses at the rear of my house. It appeared to be about 2 feet above the house but was clearly a long long way off in the distance. It certainly caught my attention. I noticed the belt of Orion was also in the sky and also visible above the rooftops to the upper right of this bright star so thought the bright star must be Sirius but then concluded it couldn't be because of its positioning, which was far too high. I observed it more intensely and was surprised to notice not only was the star intensely silver in colour but there appeared to be a glow of purple in it. I immediately went outside into my garden in my slippers and dressing gown to see it more clearly. It was a very clear night and cold, the grass underfoot very wet but I was transfixed so it was of no concern that my slippers immediately became sodden. I have corrected vision and wear glasses but even so my eyesight is not as sharp as other people with 20/20 vision so I rushed back inside to get my partner's binoculars from the cloakroom. The set of binoculars I used are just standard 'Oregon 10 x 50 WA 367ft at 1000yds coated optics'. I was absolutely amazed to view something I have never seen before in my life and have no explanation for. My initial reaction was to freeze and it felt as if my heart skipped a beat. I then felt a rush of excitement, immense awe but also a sense of fear as the adrenaline surged through me. I was looking at something that is outside of normal experience and was totally a mystery to me - was I seeing my first sighting of a U.F.O? Clearly it wasn't a star but what was it? What other explanation could there be? What I saw was totally bizarre, very beautiful and can only describe as a set of bright coloured lights, like an illuminated Xmas decoration, in the shape of an opened umbrella top (dome like) with an extremely short stubby stem for a handle. The lit up lights were mainly vivid silver but I was in awe to see there was indeed not only purple lights but also green, red and blue. It was far from static and kept dotting around its immediate vicinity and also pulsating in and out like a jelly fish, rotating and tilting. On occasion it appeared to flip and change shape to what I described as a fish (although later my partner described it as 'an eye' as he saw it had a centre to it like an iris)'. From my perspective, I would describe it as appearing unstable but I have very little knowledge of the laws and principles of aero-dynamics and flight. I didn't wish to miss this rare opportunity but decided I must go and wake my partner to witness the sighting for himself if possible and to verify what I was seeing, particularly as he has much sharper vision and might see more detail than me. I was relieved and excited to find that I wasn't going mad as he confirmed everything was as I described to him. We stood for a few minutes observing it and then went upstairs to rest our elbows on the window cill to steady the binoculars. My partner brought me down to earth and suggested it could be the earth satellite station which had never occurred to me. The object stayed visible above the roofline for over half an hour but during this time sank lower and lower, going off into the distance in a WWS direction (Falmouth Bay/English Channel direction/area?) and was also obscured by low cloud belt. by 2.45am nothing could be seen at all. I continued to finish ,my baking project and at 3.25am I went outside again and scanned over the whole sky again. I was thrilled to see yet again a bright star like object, naked to the visible eye with hint of purple but this time high in the sky in a WWN direction (St Ives/Pendeen/ Atlantic Ocean direction/area?). I didn't think it possible but on fetching the binoculars sure enough the same jelly fish Xmas decoration was clearly visible. 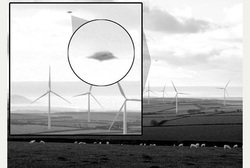 Was this another one or had it moved and reappeared in an entirely different location in the night sky. At 4am I retired to bed as I had to get up early but it was still there. My partner believes that the object would have been a long way off out at sea and must have been massive (city size) - by binoculars it was approx 1" across. I telephoned Dave Gilham and he believed that it could not have been the space Station, simply because it was not due to appear at this time, and also confirmed my belief that it was not a projection from a night club. Looking south past Padstow on the right, over the lower River Camel estuary towards Wadebridge. Im not sure whether these reports will be of any use to you, as the details (regarding time, date and weather conditions) are hazy in my memory. However, I'll describe for your potential interest. Number 1: Approximately 8 years ago, myself and my girlfriend, of the time, were driving south along the A39, between wainhouse corner and the next juction which leads to Boscastle, when what looked a little like a fatter winged glider (of sorts), with a single light on the end of each wing (can't remember the colour) flew, very slowly, directly over the road (and our heads) at a height of approximately 2 or 3 telegraph poles. As it flew over us i noticed that it made no noise at all, so tried desparately to turn my phone on, in order to get some footage. This i didn't manage to do however, as as soon as it had reached a distance of approximately 50 metres away from us it appeared to turn an extremely tight turn to it's left, at an angle of 90 degrees, and accelerate north in a way that no glider could possibly do. My girlfriend and I turned the car around (she was driving) and went back to see whether we could see it, but it had disapeared (we assumed) north-east, out of our eyesight. Both of us thought it was extremely unusual - to say the least. Number 2: Whilst driving home from work, approximately 2 years ago, west along the A395 from Launceston to the A39, just before twilight, a similar plane (although slightly larger) flew, extremely low, directly over me, from the left to the right of me. My initial thought was that it was about to land (or crash) in the adjacent field, so I turned around as quickly as possible (this probably took approximately 20 seconds or so) and looked out over the hedge in the direction it had been going. The land is particuarly flat in this direction, and due to this I could see for a number of miles and yet could see no signs of the plane. This plane like vehicle also had a single light at the end of it's wings, so it strange to me that it had completely dissapeared. Number 3: This one isn't really a sighting.... but who knows.. there could be some relevance. When i was about 18 I lived in the cellar of my parents house, (a kind of Granny annex) when I awoke in the middle of the night to an engine like noise outside my window. My initial thought was that somebody was stealing my parent's car, and for a few seconds I lay in my bed wondering what to do. I was just about to get up, go outside and confront the theif when something/someone pressed down on the base of my back, with the size of an average palm, for about 1 or 2 seconds. Then there was a pause of a second, then another push approximately 2 inches up my spine(for the same time period). Then, again, a pause, and then one last push, again another 2 inches up my back. As you can imagine, I was a bit freaked out by this, and had frozen in fear (at no point during the experience did I think the owner of the ananomous hand was human - for some reason), but after about 2seconds I spun to my side and turned on the light, fully expecting to see somebody stood at the side of my bed. There was nothing however, and the noise had also stopped. (although this may have stopped during the experience). Number 4: I was sat in the passanger side of a car, with the same girlfriend, approximately 10 years ago, when an orb of pure blue elecric-like light, about the size of a woman's fist, appeared in the empty cake box in front of me. I could see this orb clearly, as the top of the cake box was transparent, so as you can imagine, i was stunning and baffled. I looked around (it was daytime, and light) in a vain attempt to see something which could be creating this orb, but saw nothing. I then watched this orb, with fascination, for a few more seconds before it suddenly dissapeared. What puzzles me about this incident was the fact that I hadn't shown the orb to my girlfriend, sitting next to me. It had amazed me, and yet i remained completely calm. Because of the angle of the cake box my girlfriend would never have seen it herself, and after the incident, for some reason i didn't tell her about what I had seen either. Why not? Well, your guess is as good as mine. :) Although.... if I'm honest, at the time, the orb did feel as though it had some kind of intelligence to it, and it's appearance, at that time in my life, affected me in a big way (in terms of the decisions I made). I hope these accounts have been of some interest.